Probably my favorite part of watching the storm coverage yesterday (for hours, obsessively, swaddled cozily in survivor’s guilt out here in Seattle) was when CNN, scrambling for new Sandy updates, took a lengthy detour to discuss adorable ponies. 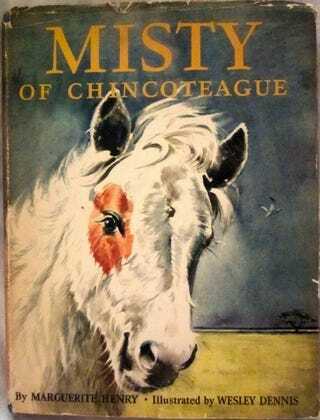 At one point, the field reporter—I think it was Ali Velshi?—heard that the town of Chincoteague and nearby Assateague Island were being flooded and battered by winds, so he paused his storm coverage to explain the entire plot of the 1947 children’s pony-novel Misty of Chincoteague. WHILE STANDING WAIST-DEEP IN ANGRY, HOWLING OCEAN FLOODS IN THE MIDDLE OF AN ATLANTIC CITY INTERSECTION. Thornton said the refuge manager on Assateague told him there was no sign of the ponies, meaning they likely were still hunkered down in sheltered areas of the 37-mile-long island. They typically head to higher ground during tidal surges, he said. The last time ponies died in a storm was the Ash Wednesday nor’easter that pummeled Assateague and Chincoteague 50 years ago.